In addition to this the pupils had exceeded the targets from last year's Big Pedal and more pupils than ever before have completed their Bikeability Level 2. 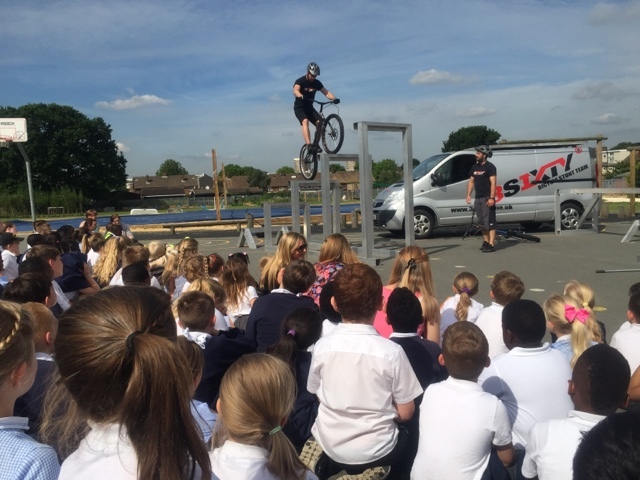 "We are so pleased with the way that all of our pupils have embraced the cycling programme that we have put in place. 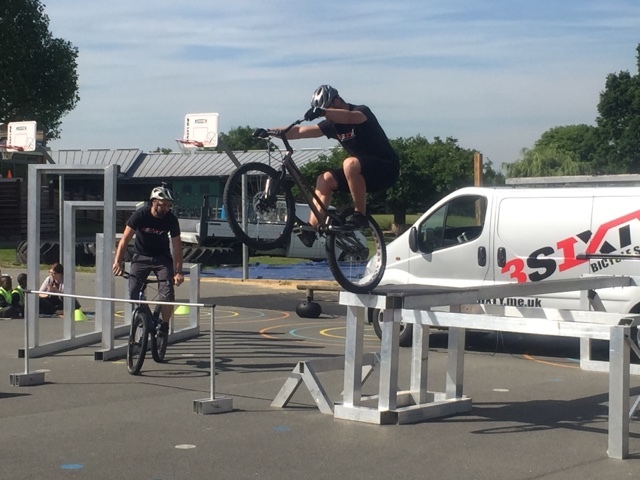 From Learning to Ride, Ditch the Stabilisers and then Bikeability we have seen pupils of all ages and abilities growing in confidence with their bikes." We have to look at video of what we have done and see how we could get more height in our jumps or why we fell off the equipment. We also give each other tips and ideas on how to improve. Some of the stunts we do have taken hundreds of hours of practice. Even if we fall off we get back on the bike and give it another go. It doesn't matter if you keep failing, just as long as you fail better each time. "I didn't realise how hard going slowly on your bike was. I thought it would be about speed, but the hardest bit was trying to balance the bike when it wasn't moving. I need to practice much more." 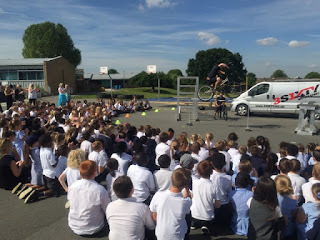 With all these budding cyclists there is little doubt the pupils will meet their targets for next year for another amazing display! Long Service Award: 25 years not out! 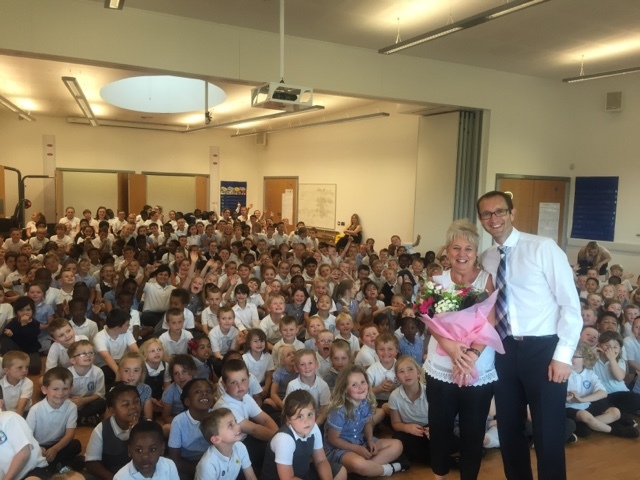 Incredibly Brenda Clements - who works in our school office - has now completed 25 years with Havering Council! In all that time she has worked for Broadford Primary: sticking plasters on grazed knees; doing the dinner registers; sorting out uniform; dealing with poorly children... and many other tasks so numerous we can't even remember them all! Without a doubt she is the heart and soul of our school and one of the key reasons why so many people who visit us remark on the warm friendly welcome they receive the minute they walk through the door. 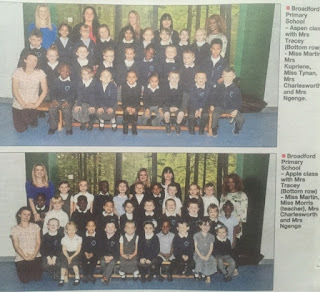 The pupils were amazed to think that she has worked at Broadford for three times long as they have been alive! THANK YOU MRS CLEMENTS - YOU'RE A STAR! Nathan Ehihon, Natalie Towner, Timi Adelowo, Oliver Hall, Evan Andrews & Daniel Kalusha: these children have all produced pieces of outstanding writing this week. Look out for examples of their work on the blog! 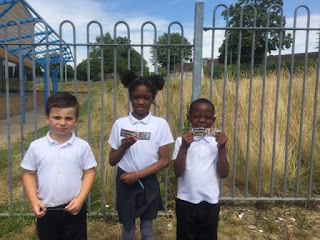 Rashid Sillah & Oliver Stay have all managed to complete 25 books and earn their bookmark. 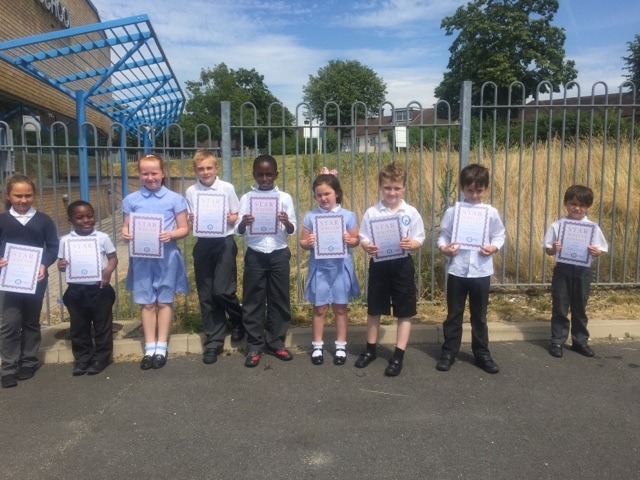 John Olatunji, Max Holmyard, Paige McGeoghan, Charlie Simpson, Nina Joshi & Leo Reynolds have collected their £5 voucher and Silver certificate. 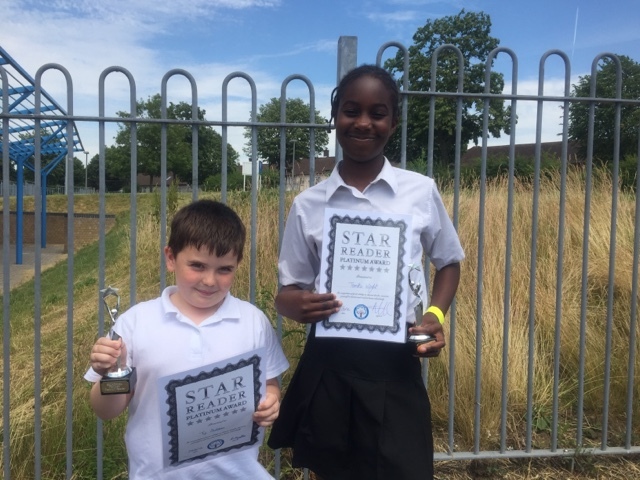 Well done to Terrika Wright who has earned her Platinum Reader trophy. Dolphins and other cetaceans (the group of marine mammals that includes whales, orcas and porpoises) undergo an unusual form of sleep called "unihemispheric slow-wave sleep." There have been gondoliers on the Venice canals for 900 years, but the first female gondolier only joined in 2010. The largest army in the world is China’s who have over 2million troops! Did you know that the fastest animal in the air is the peregrine falcon? It can fly at speeds of up to 200mph! Strangely your skin contains an oil that helps to make it waterproof. This oil isn’t found in your fingers or toes which is why they go wrinkly in the bath. We were delighted to welcome so many parents, carers and relatives of our EYFS children for the annual family picnic. In class the pupils have been learning about healthy foods and making tasty nutritious snacks. It was great to see so many packed lunches full of fruit, yoghurts and vegetables! 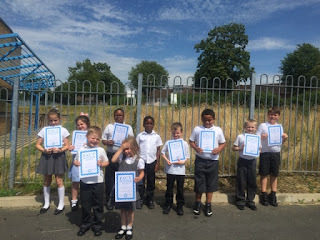 Ronnie Mersh has earned enough merits to collect his Bronze certificate. Kulsoom Hasnain has collected her Silver Pencil, while Kiera Parmenter & Sarah Wall have picked up their Silver certificate. 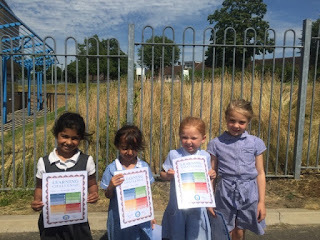 Lillie Jo Guidotti, Sam Doidge & Tahani Lowe Enu have collected their Gold certificate. Grace Moody, Roseanne Weaver & Lucy Lockhart have collected their pencil and pen set. Bradley Joy is finishing his Platinum and moving on to Diamond. 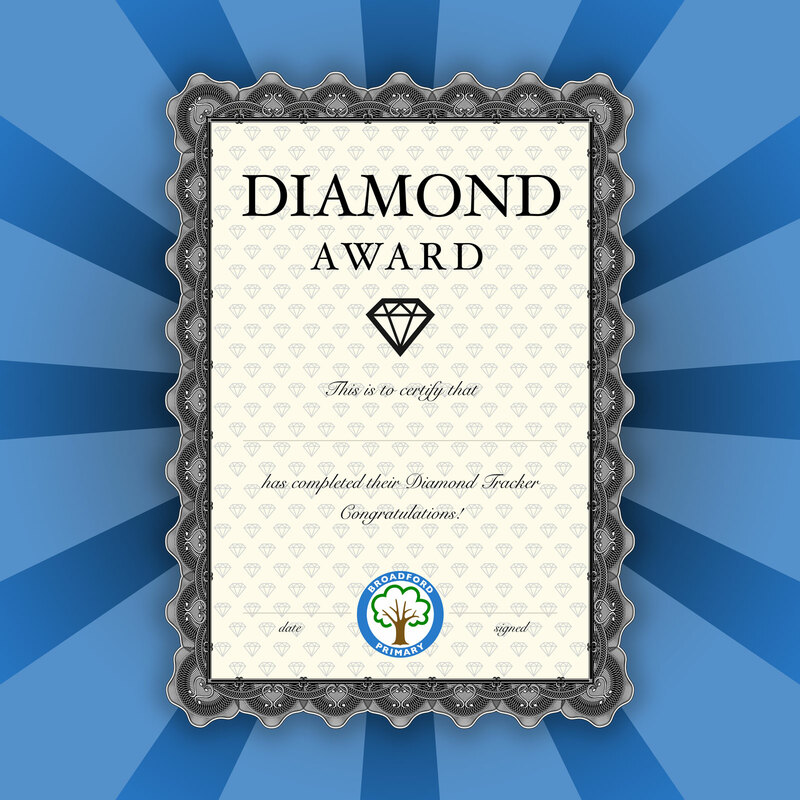 Terrika Wright & Jacob Owsley have collected their Diamond prize. 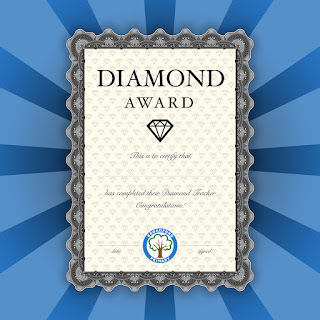 Jacob & Terrika Wright have also managed to stick the last stickers on their Diamond tracker. Did you know that Queen Elizabeth II is now the oldest monarch in the world. The Queen, who turned 89 this year, gained the title after King Abdullah of Saudi Arabia, died in January. Amazingly we can survive for weeks without food, but only for a short time without water. We lose water through sweat, urine, feces and even breathing. This water needs to be replaced in order for our organs to continue to work properly. Did you know that the rings around Saturn shimmer as they have lots of ice crystals. These reflect the light from the Sun. Did you know that Sir William Herschel was a German-born British astronomer and composer, who is widely credited as the founder of sidereal astronomy for observing the heavenly bodies? He built his own very powerful telescope & found the planet Uranus! Some scientists claim that the human brain contains roughly 100 billion neurons. Multiply each of these 100 billion neurons by the approximately 1,000 connections it can make, and you get 100 trillion data points, or about 100 terabytes of information. 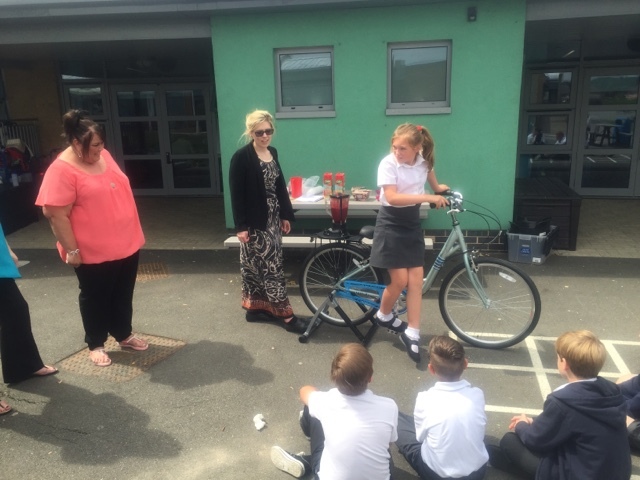 Last week our pupils had a chance to use the smoothie bike and put their pedal power to good use. "First we put the fruit into the blemder. Then we took turns pedalling the bike to make it blend together. It was hard work! 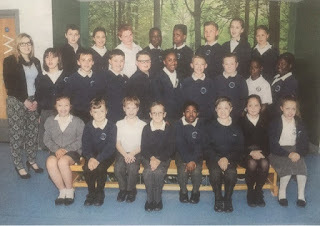 Luckily we had the teachers to help us. It made me realise how much electricity the blenders must use because my legs really ached!" "Normally I might have a Coke or lemonade if I was thirsty. However the smoothies were really tasty. I could make one of these at home!" What would you put in your fruit smoothie? 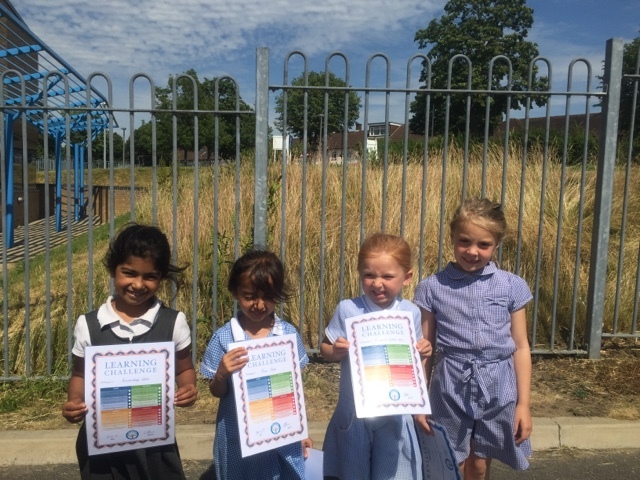 Nina Joshi, Isabelle Curtis Rich & Amandeep Ubhi have all extended their learning at home and completed elements of the learning challenge. Creating paintings, drawing portraits and learning poems: these are just some of the activities they have completed. This week we are delighted to announce that we have far exceeded our target of 95% this week – so well done to everyone for getting job #1 done (turn up every day on time). 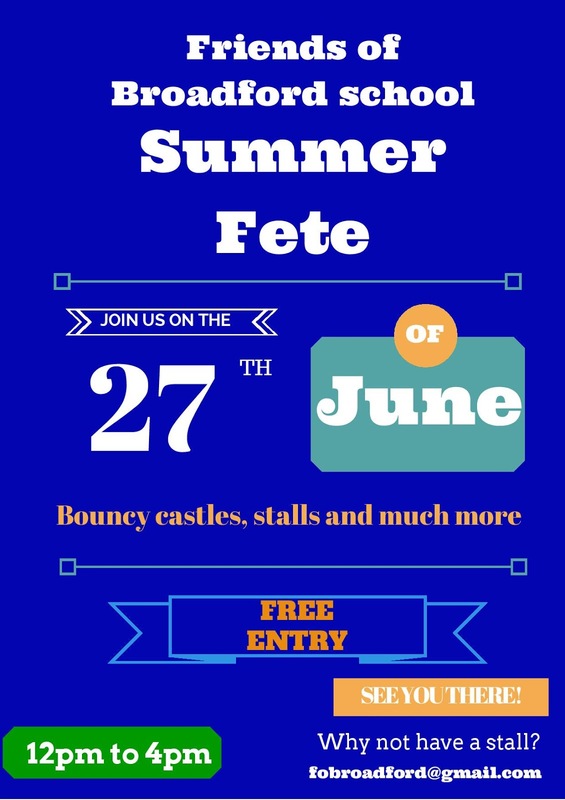 Don’t forget we are very close to the Bouncy Castle fun day… if you are less than 95% you will miss out on the extra session! We start the week with a performance of Oliver Twist for all the children. 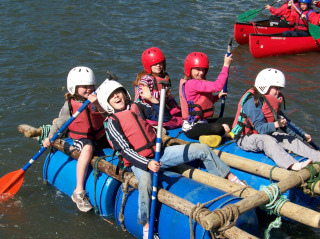 On Tuesday Year 5 have got a visit to Brittons school. On Wednesday the Romford Recorder are in to photograph the pupils’ work about the Queen in preparation for her becoming the longest serving monarch. Thursday is the day for our termly trip to the Redbridge Cycling Centre where our pupils can develop their skills in a more testing environment. After school we have the full Governing Body meeting. 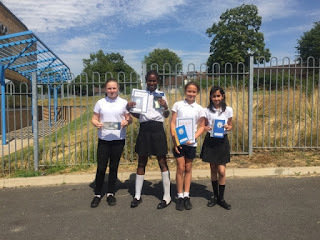 At the end of the week our top mathematicians in Year 6 are off to Hall Mead to compete in the maths quiz. Our Spinebreakers are off to Waterstones to select some new books for the library and it is the last day for clubs! 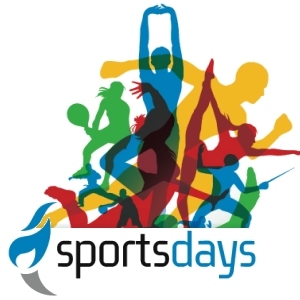 Please be advised of the dates for the Sports Days this year. It would be great if you are able to attend and cheer your children on! There won’t be any clubs running for w/c 6th & 13th July so all children will have to be picked up at 3.15pm. 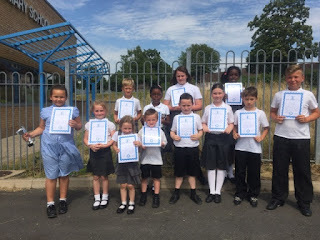 After school clubs will start again in September. In addition to this Calum played 'Bulldogs'. This is a game where people have to get you. If you are caught then you join forces and try to catch those who are left. Calum goes to his boxing club (Five Star) every Sunday. 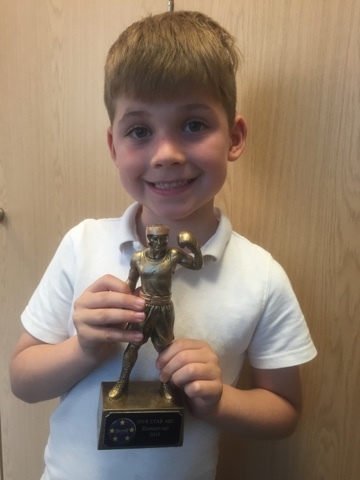 Well done Calum for working so hard in a club that will help you stay very fit and strong! Don't forget to have a go at the maths challenge outside the hall. 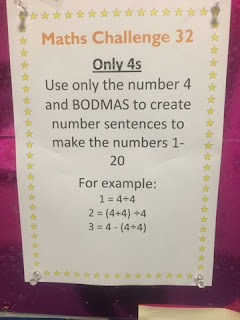 This week you need to be resourceful with your use of the number 4 and be able to draw using only certain shapes. Are you up to the task? Apologies for any confusion. The time for the final Stubbers meeting is 2.30pm on Tuesday 23rd June. 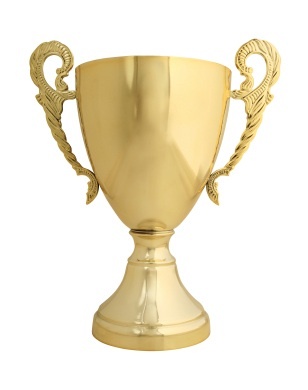 So close to award but beaten by West Rise Jun - congratulations to them. So proud of Broadford staff... couldn't have achieved the results without a team effort. Very excited for the awards tonight. 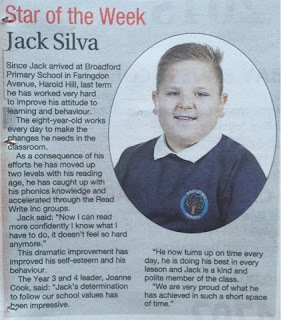 Great recognition for the pupils, families, staff of Harold Hill. 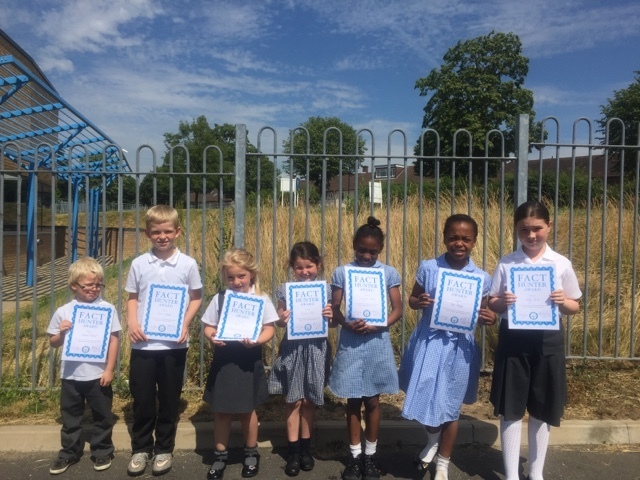 In addition to this there is a story about our recent Giant Walk to highlight the need to reduce driving speeds in built up areas. The River Nile is about 6,670 km (4,160 miles) in length and is the longest river in Africa… and in the world! Although it is generally associated with Egypt, only 22% of the Nile's course runs through Egypt. 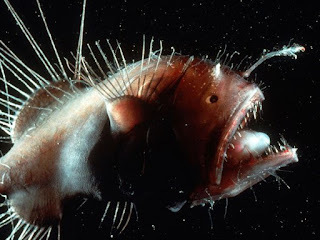 The anglerfish gets its name because of its method of predation (hunting). It has a long, modified dorsal fin spine sprouting from the middle of its head that ends in a fleshy growth that can move and wiggle to resemble another animal, tempting its prey in. Did you know that the world's smallest fish is Paedocypris progenetica from Indonesia? Mature females measuring 7.9 mm (0.31 in). This fish has a translucent body and a head unprotected by a skeleton. 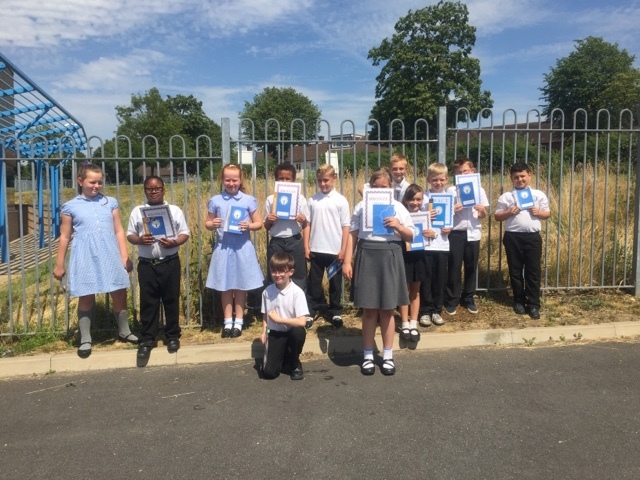 Our Year 5 pupils are off to the Junior Citizen event on Tuesday morning. 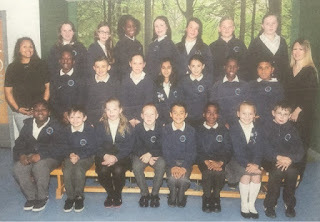 In the afternoon of the 23rd we have the Year 6 final Stubbers meeting. Year 5 then have their Shakespeare workshop on Wednesday (they are studying Macbeth) and the school nurse is doing her last drop in session of the year. 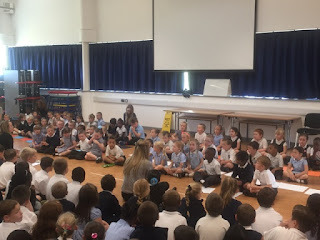 Also that morning we have the whole school Spelling Bee followed by a Magna Carta workshop for Year 4. 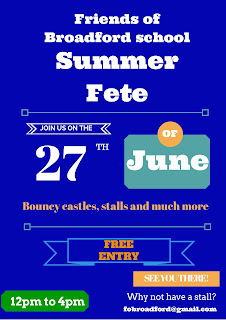 On Thursday 25th we have the BMX Stunt Show in the morning and Thames Chase are in to work on the play house. 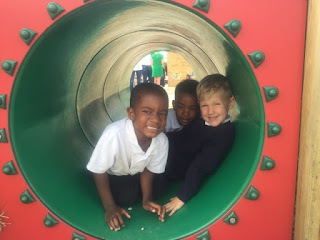 Finally we end the week with the Reception & Nursery Stay & Play Picnic. 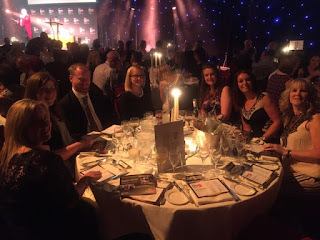 There are more details on the EYFS blog. Friday also sees the return of Phil for the cycling club. 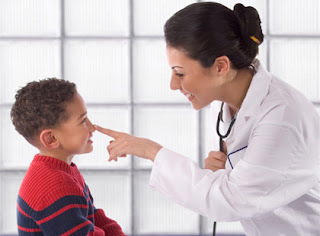 Our school nurse will be in for the last drop in session of the year on Wednesday. Please come to the main office. 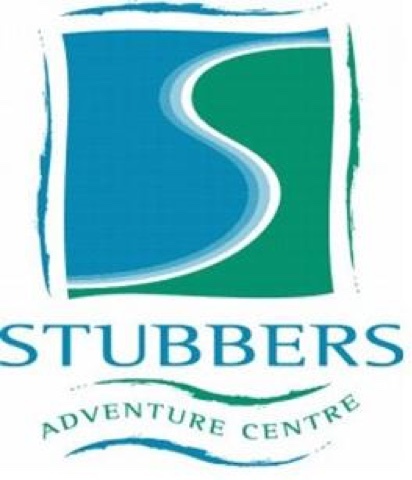 We have the final information session for parents about the Y6 Stubbers residential trip on Tuesday afternoon. TES Awards: No clubs on Friday afternoon! 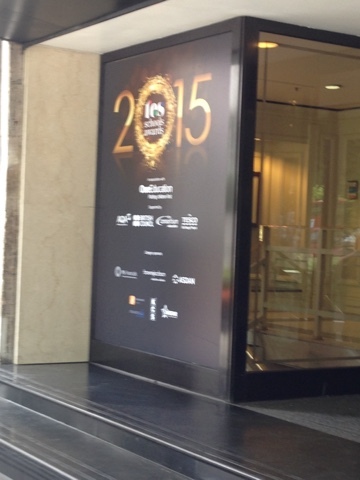 We end the week with the TES Awards which are taking place in London. Broadford Primary has been shortlisted in a group of just seven other schools for the title of Primary School of the Year! As a consequence there will not be any clubs running on Friday afternoon. All children will need to be picked up by 3.15pm. Hopefully we will be able to bring the trophy back on Monday morning! Fingers crossed. Some more great press coverage, this time of our Harold Hill maths competition! This morning we had a delightful assembly presented by our Reception children. Aspen & Apple class collaborated to tell us all about their learning. 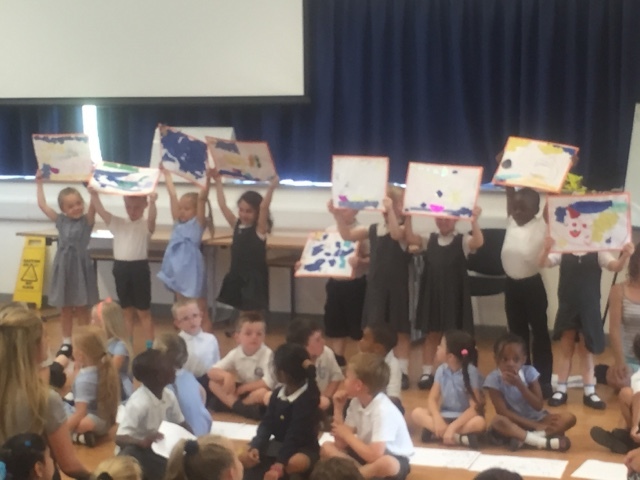 Phonics, songs, maths, art and stories: it was a packed presentation and a lot of fun! Have a look at the video below to catch up on the highlights! Morgan has really enjoyed learning about the work of David Hockney. 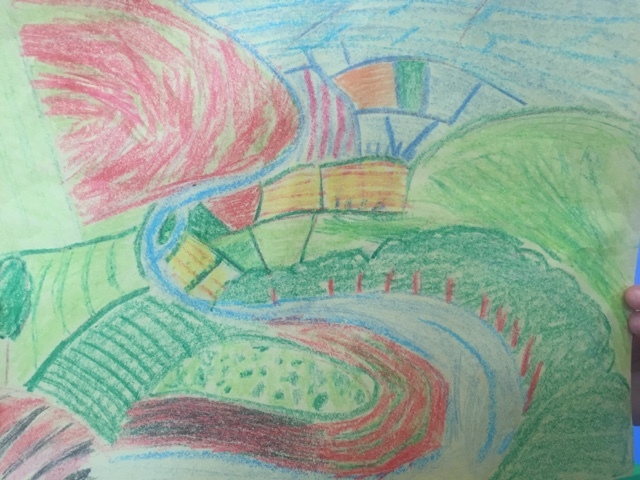 Inspired by his landscapes, she has had a go at doing some of her own at home. "I loved all of the colours he uses. 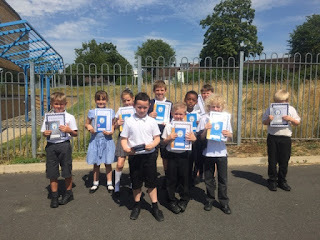 I wanted my pictures to be bright and cheerful"
Why do we use Parent Gym? We believe in supporting our parents and families to develop the confidence, skills and knowledge to be effective parents. We believe that thriving parents and homes produce children who are ready to learn. 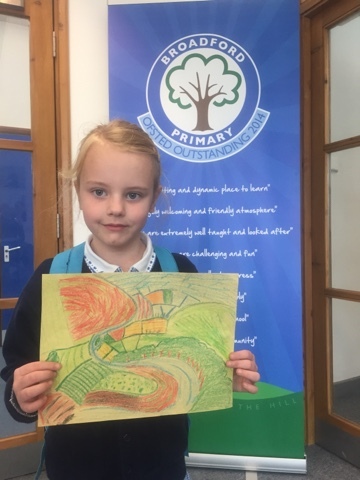 We believe that our parents should feel that they are part of the school community and able to seek advice and help when required to support their children - our pupils. The programme is aimed at parents and run in primary schools across London. 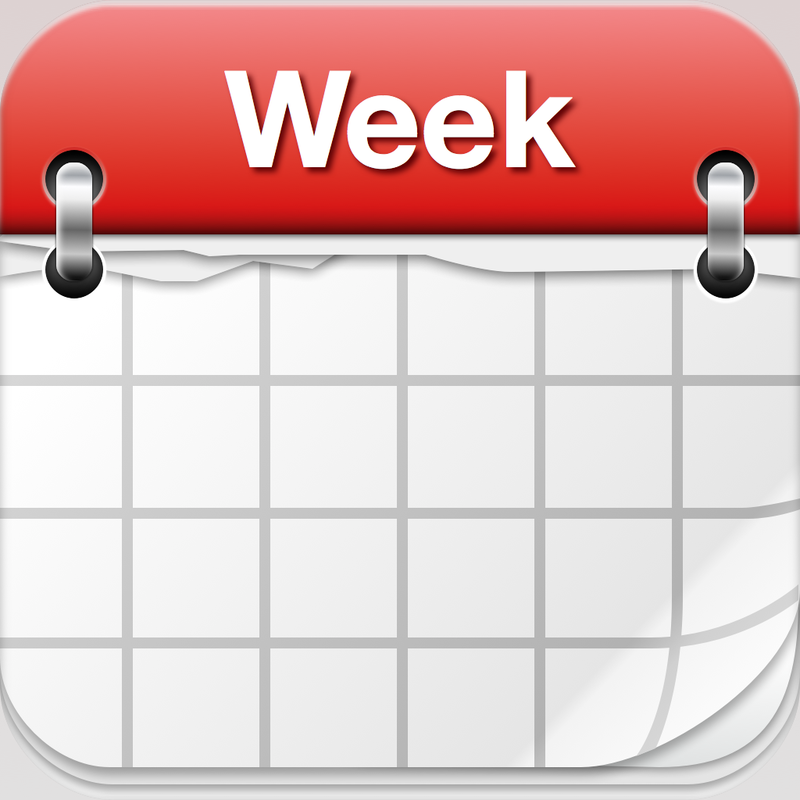 It is a a six week face-to face programme which is completely free! What does Parent Gym actually do? Parent Gym increases the chances for children's success by changing how their parents think and behave. 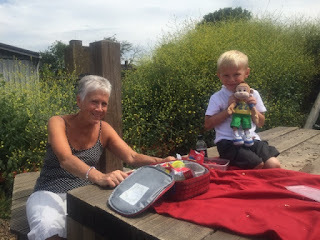 Parents bring their children along in the morning, talk with a tutor they trust, stay for a couple of hours and end up chatting with the parents of their children’s friends, who often become friends of theirs as a result. Without a doubt, discovering that your neighbours have very similar challenges helps people open up. Building their own local networks not only keeps parents coming to Parent Gym, but also means they have people to help out with child cover, organise treasure hunts and share a worry. Look out for the next sessions starting in September 2015! 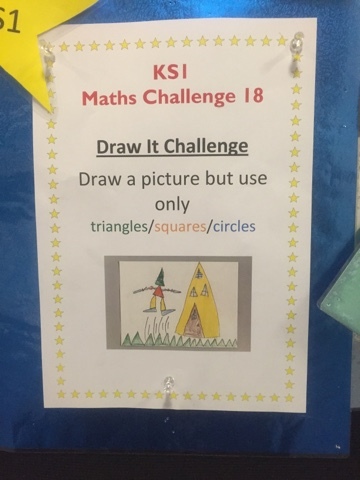 Please contact the office if you are interested in taking part. 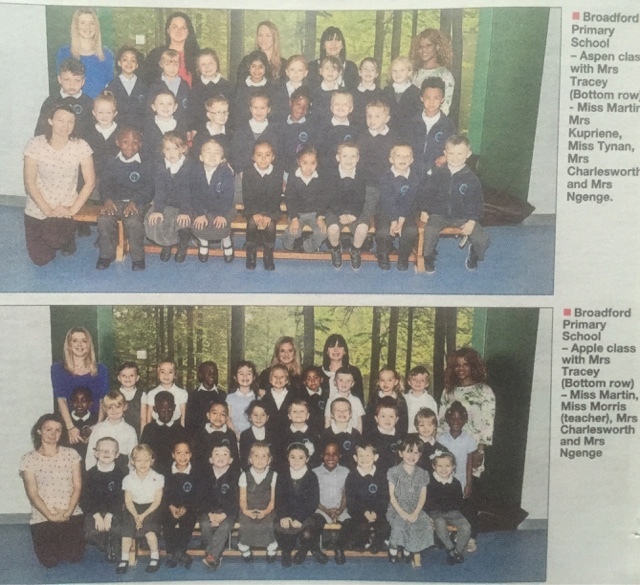 If you have children in either Year 6 or Reception then make sure you get your copy of the Romford Recorder today. 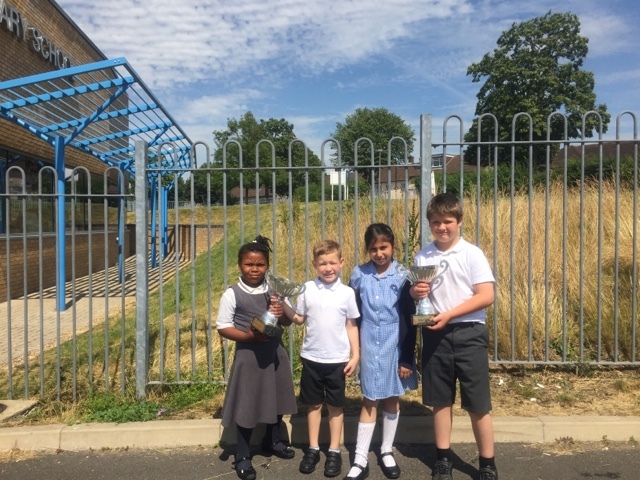 Both cohorts of pupils are featured as well as a story about our maths competition with the rest of Harold Hill. Pupils from Broadford Primary School joined over 100,000 children across the UK taking to the streets on 10 June 2015 as part of Brake's Giant Walk, the road safety charity’s initiative sponsored by Brantano to get children walking and highlight the importance of road safety to children leading active, healthy lives. Over 100,000 children taking part in the event are walking a combined total of over 60,000 miles, learning about road safety and calling on drivers to ‘GO 20’ in communities to make streets safer for kids to walk and cycle. Almost half (46%) of UK primary school children are driven to school , impacting on children’s health and contributing to congestion and traffic danger. This lack of physical activity is a factor in rising childhood obesity, with three in 10 children in England aged two to 15 now overweight or obese . The World Health Organisation recently warned of a looming obesity epidemic if lifestyles do not change, with three-quarters of men and two-thirds of women in the UK projected to be overweight in 15 years’ time . British kids have expressed their wish to get out and about more on foot and bike, with three quarters (76%) of participants in last year’s Giant Walk saying they want to walk and cycle more, to get to school, go to the park, or to see friends. However, more than half (56%) said they are scared of being run over by traffic when walking or cycling on roads . 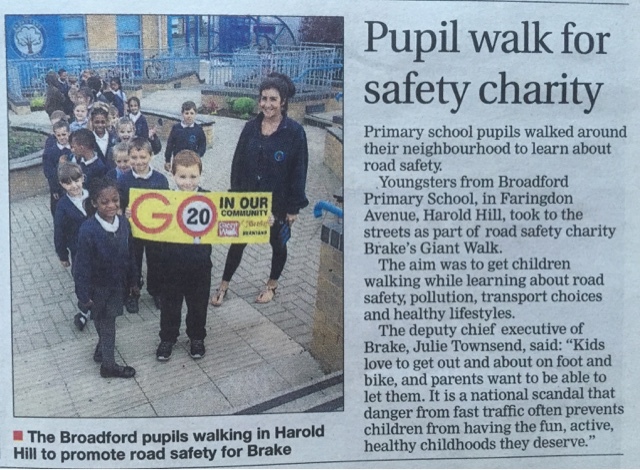 Brake is campaigning for drivers and government to take action to make streets safer for kids and help them enjoy a healthy, active, happy childhood, by backing Brake's GO 20 campaign. For drivers, this means slowing down to 20mph or less wherever there may be people on foot or bike, and always keeping a look out for vulnerable road users. For government, this means implementing widespread 20mph speed limits in towns, cities and villages – one of the most effective measures identified by the World Health Organisation to reduce pedestrian casualties . Julie Townsend, deputy chief executive, Brake, said: “Recent reports have provided a stark warning about the potential consequences of the UK slipping further into a spiral of physical inactivity. The impacts will be felt hardest by our children, who could face a lifetime of poor health and pick up the bill for rising healthcare costs. This crisis can be averted, but we need urgent action. Follow Brake on Twitter or Facebook.